It had to be work-appropriate but look equally at home in a nice restaurant. It couldn't wrinkle as the day wore on and had to be comfortable. The weather forecast called for rainy and chilly, so the outfit had to be warm and, well, rain-proof. All things considered, I don't think I did too badly. I wore this outfit last Friday for work followed by a Dine Out reservation at Bacchus. The accessories are the saving grace here. The necklaces dresses up a black dress quite well, and once again I'm glad these rain boots are a bit dressier than the typical galoshes you see on the street. But hey, once the boy picked me up and we arrived at Bacchus, what I wore became negligible in the face of quality time with him and a delicious three-course dinner. He had a creamy parsnip soup, strip loin and root veggies, and mocha creme brulee; I had smoked salmon, duck confit and cheesecake with salted caramel mustard. We both drank dirty martinis with olives. Mmm that was a good meal. Those of you who've been following this blog for a long time might recall that this CiCi sweater dress has a bow on it--or had, rather. I like the shape and soft material of this dress, but the bow kept me from wearing it as much as I would've liked to because it limited accessories options. You can't wear a jewel-encrusted necklace with a bow on the chest--it's too much going on. So in the end I took the bow off; it's probably going to be worn a lot more with brooches and various necklaces from now on. You did a really good job. It's not easy to dress for work and a function at the same time! Love the boots. I love the Kate Spade rain boots! So stylish and practical! Good choice-I think it looks better without the bow. Great necklace too! LOVING the boots and necklace. Makes me want a new pair of "grown up" galoshes! Just found you via Sal's post. Loving your style! I too work in an artsy downtown (NY) environment, and I am totally bookmarking some of your looks for inspiration! That necklace is killing me. SO COOL! Hello! I'm a new reader here! Just had to add you after seeing your post on "work outfits" on already pretty. I loved the collage of your outfits, they are all super cute! Perfect work-to-evening outfit Lisa! Love the H&M necklace, such a great piece to make a simple outfit very edgy and elegant! Your rain boots are really pretty! I love this. It's so chic and simple! Those rain boots are scrumptious. Simply scrumptious. I love how they and the necklace take center stage. Thanks for the comment! Love the pop of the red in the boots! i love the necklace.. it's rock..
Love how you spiced up the dress with the necklace--it is gorgeous! I'll never tire of seeing those rain boots on you. 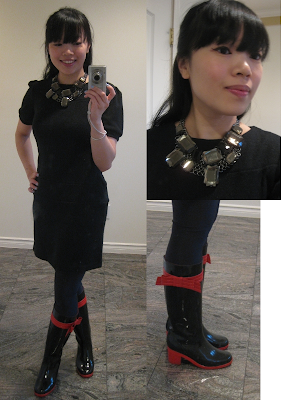 And the necklace works perfectly with that sweater dress! Like others said, that necklace adds such an interesting detail to the outfit! As a former Vancouverite, your post made me miss it a little. I really like this outfit. The boots are great and the necklace is gorgeous. You got rid of a bow? What! No! Sacrilege! What would Blair say? Okay, I guess Blair would be okay with that.